HONG KONG - A strong, vigorous handshake that lasted more than a minute marked the historic first meeting between the leader of the People’s Republic of China and the leader of Taiwan, which has been the home of the government of the Republic of China since its defeat by the Communists in the Chinese civil war in 1949. “Blood is thicker than water,” declared Chinese President Xi Jinping, using a Western proverb that has become absorbed into the Chinese vocabulary, especially in describing relations between the two sides of the Taiwan Strait. The mutual emphasis on Chineseness is understandable. After all, that is what they have in common, despite political separation over the last 66 years. Their people, by and large, share Chinese ethnicity and culture, setting politics aside. But politics cannot be set aside. 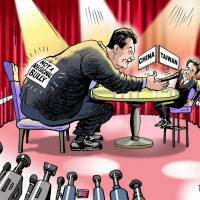 Beijing insists that there can only be “one China,” namely, the People’s Republic of China. But Taiwan cannot agree that the Republic of China doesn’t exist and so it insists on “separate interpretations” of what “one China” means. The Taiwan side’s press conference was held by Ma himself, who answered well over a dozen questions posed by reporters from China, Taiwan, Singapore, Hong Kong, Japan and the United States. 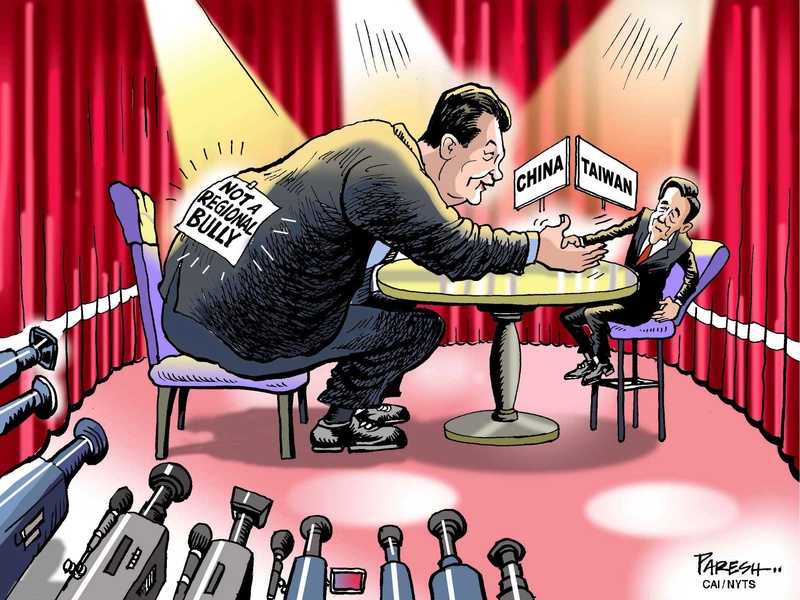 In the press conference, Ma told the media that he had used the words “Republic of China” in his meeting with Xi, despite frequent criticism that he was reluctant to speak up. “I had to stand firm by the position that the president of the Republic of China should adopt,” he said. Ironically, Ma was telling Xi that the Republic of China, which the People’s Republic of China does not recognize, was his ally in opposing Taiwan independence. Ma called for the strengthening of the “1992 consensus” under which both sides agree there is only one China but differ as to what that actually means. In addition, he called on the mainland for a reduction of its missiles targeting Taiwan, the setting up of a hotline and more international space for Taiwan. Xi was wishy-washy on international space but was prepared to consider a hotline between China’s Taiwan Affairs Office and Taiwan’s Mainland Affairs Council. He denied that Chinese missiles targeted Taiwan. But, of course, targets are easily changed. The Singapore meeting was unique in many ways. This was not a meeting between two states but between two political entities that don’t officially recognize each other. Regardless of how much — or how little — was achieved in this meeting, it did set a precedent for leaders in China and Taiwan to meet as equals as far as protocol is concerned, regardless of which party is in power in Taiwan. In the old days, Beijing insisted that any meeting with Taiwan would be a meeting between the central government and local authorities. Then the Communist Party developed relations with the Kuomintang (KMT), or Nationalist Party. Hu Jintao, Xi’s predecessor, sent congratulations to Ma when he became KMT chairman in 2009. Similarly, Ma congratulated Xi when the latter assumed leadership of the Communist party in 2012. However, Ma gave up the party chairmanship last year when the KMT suffered drastic setbacks in local elections. So the meeting last week could not be between leaders of two parties. Thus, the two sides resorted to calling each other “Mr.” since they could not use the titles of state president or party leader. The groundwork has been laid. But whether the lady who heads the pro-independence Democratic Progressive Party will be willing to meet with the gentleman who is head of China’s Communist Party is another question entirely.